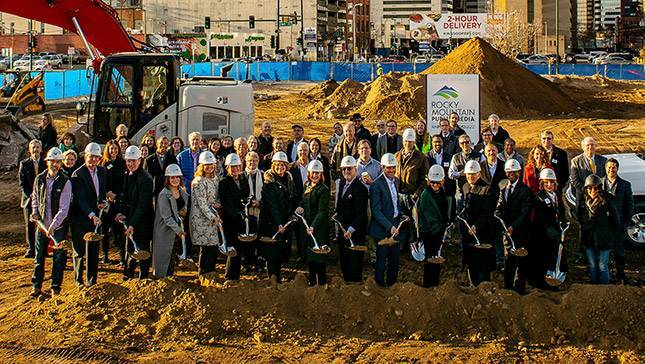 DENVER — Nov. 29, 2018 — Rocky Mountain Public Media, Colorado’s largest statewide, member-supported, multimedia organization, broke ground today on the Buell Public Media Center, a multi-purpose building that will house Rocky Mountain PBS and KUVO, serving as a center for public media throughout Colorado and a hub of new development in Denver’s Arapahoe Square neighborhood. The Buell Public Media Center’s $34 million capital campaign, anchored by a $6 million gift from the Buell Foundation, is now $3.5 million from of its goal and has closed on all needed financing so construction can begin. The campaign total was increased by $4 million from the original $30 million goal to cover the cost of underground parking. Joining Rocky Mountain Public Media staff, board members, key donors and volunteers at the groundbreaking ceremony today were: Jeff Barratt, executive director and CEO, Emily Griffith Technical College; Rafael Espinoza, City Council, District 1; Allegra “Happy” Haynes, Denver Deputy Mayor; Julie Martinez, director of Denver Media Services; Wayne New, City Council, District 10; Dan Ritchie, president, Buell Foundation; Jenny Schiavone, director of citywide marketing, City and County of Denver; Susan Steele, executive director, Buell Foundation; and Gary Steuer, president and CEO, Bonfils-Stanton Foundation. Located three blocks east of Coors Field, the Buell Public Media Center, paired with the adjacent residential, office and retail project planned for a Lawrence Street parcel sold by Rocky Mountain Public Media, is invigorating neighborhood development. It will also serve as an anchor along the 21st Street section of the 5280 Loop, a visionary project of the City and County of Denver and the Downtown Denver Partnership that links neighborhoods and connects people by reimagining underutilized streets into the essential downtown experience uniting urban life with Colorado’s outdoor culture. In addition, the ground floor will include the Doug Morton and Marilyn Brown Community Classroom, which will combine with community media studios and other offices to create a 5,000-square-foot Community Media Center where Emily Griffith Technical College and the City and County of Denver will teach classes for creative industry jobs, including internship opportunities with RMPBS and other media outlets. The building’s second floor will house Rocky Mountain PBS and KUVO radio operations, including the Koelbel Live and Local Studio, the Phyllis A. Greer Music Listening Lounge, the Dr. Patricia Pacey and Mr. Charles Neinas Content Hub, and the digital distribution infrastructure to support the media center’s statewide advanced technological capability. The building’s third floor is earmarked for co-located media enterprises. The Capital Campaign Cabinet is co-chaired by Mary Sissel, past RMPBS Board Member and community leader; Chad Hollingsworth, senior vice president, corporate development with Liberty Media; and Patricia Pacey, president of Pacey Economics, Inc. The project team includes: Tryba Architects – architect; Mortensen Construction – general contractor; Wells Partnership – owner’s representative; The Kellogg Organization Inc. – fundraising counsel; Pueblo Bank and Trust – banking partner; and Wells Fargo – banking partner. To watch the project’s progress through its completion, visit Rmpbs.org/capital-campaign. Rocky Mountain Public Media is Colorado’s largest statewide, member-supported, multimedia organization and the parent company of Rocky Mountain PBS and KUVO radio. Rocky Mountain Public Media has more than 85,000 members representing every county in Colorado and reaches 98% of the state’s citizens through television, radio and digital platforms. A non-commercial media organization by and for the people of Colorado, we create high quality local and multimedia content through Regional Innovation Centers in Denver, Colorado Springs, Durango, Grand Junction and Pueblo. Our enriching journalism, educational and cultural programming connects and engages citizens for lifelong impact. RMPBS, started in Denver in 1956 as Colorado's first public television station, is now a statewide television network, with stations in Denver (KRMA), Pueblo/Colorado Springs (KTSC), Steamboat Springs (KRMZ), Grand Junction (KRMJ) and Durango (KRMU). Visit us at www.rmpbs.org.